Toys made from Natural exotic forest free wood. Java Wood Toys takes pride in making unique products from non-productive coffee trees, using natural, renewable, recycled and earth-friendly materials. CLICK ON PICTURE OF TOY AND SCROLL OVER IT WITH YOUR CURSOR FOR LARGER VIEW! Bamboo Block Cluster by Happy Beaks is filled with colorful wooden blocks accompained by a bell and hung on a stainless steel chain. This toy is durable and easily clips to the top of your bird's cage. Rawhide Block Cluster by Happy Beaks is filled with colorful wooden blocks accompained by a bell and hung on a stainless steel chain. 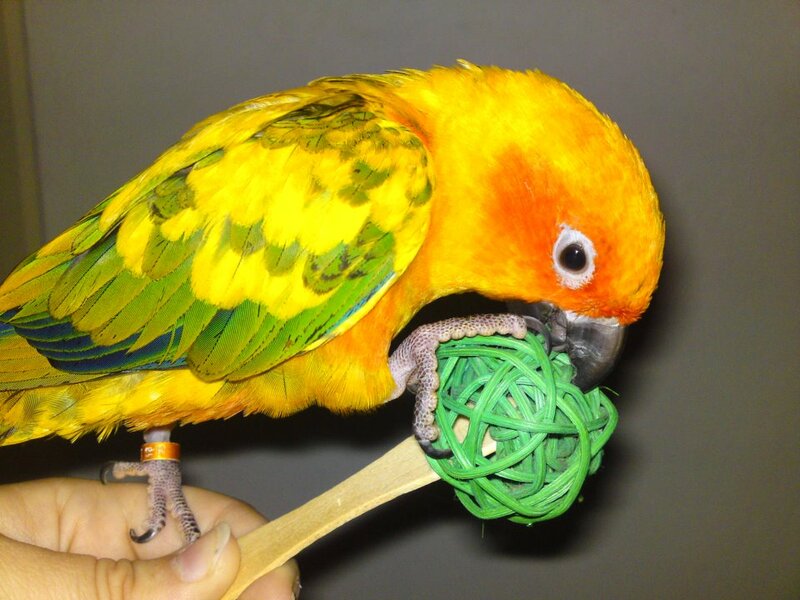 This toy is durable and easily clips to the top of your bird's cage. Lots of texure here! Great for smaller birds who love to tear things apart. Four strands of wood slats, vine balls and wood beads finished with a rattan star. Recommended for smaller birds, such as cockatiels, conures, caiques, pionus, hahns macaws and similarly sized birds. An absolute favorite! Great for Medium to larger birds who are less agressive chewers. Lots of fun here! Four strands of wood blocks and wooden balls hung on chain on a huge wood block. Sure to be a beak pleaser! Great for Medium to larger birds who are less agressive chewers. Lots of enrichment here! Four strands of wood blocks hung on chain woven through PVC pipe. 21.5" x 6.25" x 6.25"
HUMONGOUS! 35 inches long! Study and able to challenge even the most avid of chewers! Recommended for large birds such as Macaws, Cockatoos and other similarly sized birds. Weighs amost 14 lbs! 35" x 9" x 9"
HUGE HUGE HUGE! 34 inches long! Designed with those BIG BEAKS in mind. Recommended for large birds such as Macaws, Cockatoos and other similarly sized birds. Weighs 12 1/2 lbs! 34" x 7.5" x 7.5"
Great toy for the smaller birds, coconut husk chunks, java slices and folded banana leaves are all hung on chain. Hide treats between the folded banana leaves for foraging fun! Let's swing! All plastic, easy to clean and sure to please any bird. Great for smaller birds, such as conures, ringnecks, quakers, pionus, caiques and similarly sized birds. Not recommended for larger, destructive birds. Birds need natural toys to pick, chew, shred, and forage to condition their beaks and satisfy their instincts. The Coco Monkey Bird Toy is a coconut shell, cut into an adorable monkey face. Your bird will spend hours picking toys out of the mouth. Fill it with treats for a sweeter reward. Java, rattan ball, sisal, bamboo, coconut - all from natural earth-friendly materiials. 11" long! 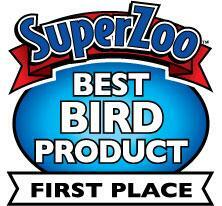 Great for small to medium size birds, from Caiques to Eclectus. Make this a foraging toy, too! Java, rattan ball, sisal, bamboo, coconut - all from natural earth-friendly materials. 14" long and 10" wide! Great for medium size birds, from Caiques to Eclectus. Make this a foraging toy, too! Java, rattan ball, sisal, bamboo, coconut - all from natural earth-friendly materiials. 14 long! Great for medium size birds, from Caiques to Eclectus. It may be large, but it sure is fun! Make this a foraging toy, too! HUGE!! Java, rattan ball, sisal, bamboo, coconut - all from natural earth-friendly materiials. 32" long! Great for medium to large birds from Eclectus to Macaws. It may be large, but it sure is fun! Make this a foraging toy, too! ENORMOUS!! Java, rattan ball, sisal, bamboo, coconut - all from natural earth-friendly materiials. 36" long! Great for medium to large birds from Eclectus to Macaws. It may be large, but it sure is fun! Make this a foraging toy, too! All natural java galore, rattan balls, sisal, wood, coconut, loofa- all from natural earth-friendly materiials. 13" long! Great for medium size size birds, from Caiques to Eclectus and smaller Cockatoos and Smaller Macaws.. 13" long. All natural java galore, rattan balls, sisal, wood, coconut, loofa- all from natural earth-friendly materiials. 19" long! Great for medium to large size size birds, from Eclectus and smaller Cockatoos and Macaws.. 19" long. A bundle of 25 colored 5 cm rattan balls ready for making that favorite toy. Use for foraging or foot toys, too! Approximately 2.5" in diameter. A bundle of 10 colored 8 cm rattan balls ready for making that favorite toy. Use for foraging or foot toys, too! Approximately 3.5" in diameter.